Whether you’re a guy or a gal buying for your father, grandfather, brother or life partner, choosing a gift can be stressful…even painful process! Men are notoriously hard to buy for, no matter what the occasion. Thankfully, there’s now a real solution designed to make it virtually impossible to mess up your loved one’s gift. TheBroBasket.com offers the coolest choices of custom baskets that scream masculine… delivered right to his door. 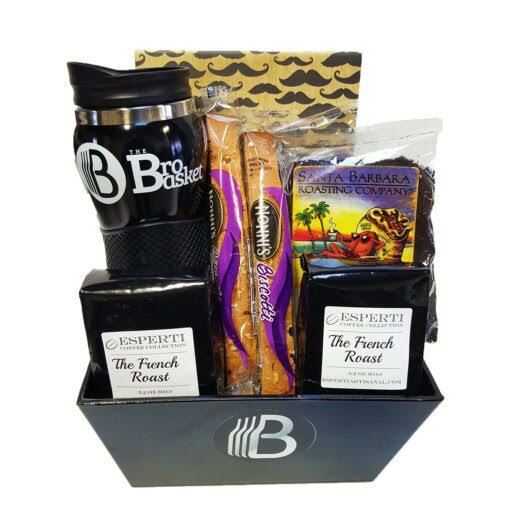 Unlike anything out there, TheBroBasket’s gifts include craft beer, fine wines, and spirits along with their favorite brand name gear and goodies. All baskets are 100% customizable and come in non-alcoholic versions too like this beautiful Coffee Basket! This coffee gift is perfect for all of those coffee lovers in your life. It comes with locally roasted organic coffees from Ventura County’s Esperti & Santa Barbara Roasting company. How do I know they’ll love it? Because I love coffee too! This BroBasket is perfect for people like us, people that want to enjoy a hot cup of joe with a side of some tasty biscotti! I am offering ONE (1) wonderful BroBasket Coffee Gift Basket giveaway to ONE (1) winner. To enter this contest, just tell me who you will be giving this basket to if you win in the comments section. Giveaway ends June 7, 2017, at 12:00 am. Filed Under: Coffee, EASY, Give Away!, GIVEAWAY Tagged With: BroBasket Coffee Basket Giveaway, Coffee, Giveaway!! My husband loves coffee so I would give it to him. With Father’s Day coming up, my dad. This would make a great gift for my dad, he loves his coffee, thanks for the chance to win! My husband would love to get this basket either for his birthday or Father’s Day. To tell the truth, I would probably keep it for myself!! I LOVE COFFEE!! Thank you for the chance! I would give it to my husband if I won. He loves coffee! I would give this gift basket to my dentist. He is a great coffee lover and a wonderful dentist and person. He goes out of his way to take care of his patients and others. My son was home on leave from the Army. My son had a dental problem and our dentist came in on his day off to take care of our son and he didn’t charge him anything because he was serving our country. What a selfless person.. I would give this to my husband if I won. This would be the perfect give for my younger brother! He does so much for me and I’d love to be able to give back! I will be giving the basket to my son. He just graduated, and is moving. So, this would be a great housewarming gift. Oh, great – now I’ll feel like a selfish you-know-what because . . . ME! I’d give it to ME! But wait! I have to admit, after careful consideration, it would be the perfect Father’s Day gift for my son-in-law. So yes, if I win it, I’ll be gracious and let it go to him. Sigh. This gift, if I won, would go to my brother. He is such a hard worker. He still drives a Semi, has 4 grown children and 5 grandchildren. He does babysitting on his own and runs around to make sure he sees everyone. Always visits my 96 year old mother, even if very very tired. He starts work at around 3 a.m.- 4 a.m. most days. He is very special. Plus, someone I have always been able to fall back on, if needed.. I could go on, but I won’t… With all he does you can see why a Coffee Basket would be ideal for him.. Plus, he does love his coffee.. Thank you Nettie..
I’d share it with a guy in my life! I’ll give it to my cousin who’s a great dad. If I won I would keep it for my husband and I. I would love to try this out. Thank you for the entry. Good Morning! If I won, I’d give it to our new Pastor at church since I don’t drink coffee anymore. My husband would love this, so I’d give it all to him 🙂 Thanks for the chance to win. I would love to give this basket to my husband who has been my partner & best friend for 32 years! Mu hubby would love it!! Even though I’m a “Nonnie” of eight beautiful grandchildren and would love to keep it, I would let my daughter take it to her work (at a small school for special needs). There are so many that work so hard and never receive any recognition. I’d love for a special person that has given all to these children to receive it. (Whether to a teacher or special parent, it would be a wonderful gift.). Thank you for the opportunity. I would love to give this to my son-in-law, Bryan Stone. Like me, he loves coffee. I would give it to my father-in-law.